The following Miniature Schnauzer video is brought to you by Animal Planet. Sylvia Hammarstrom has bred more than a thousand champion Schnauzers in her career. They include all three breeds: miniatures, standards and giants. Her kennel is responsible for breeding nearly one-third of all the giant Schnauzers in the country. In the 1970's she added Minis to her kennel, specializing in the pure black. Today the kennel has all four colors: black, black & silver, white, and pepper & salt. So get a cup of tea, get comfy, and let's enjoy learning all about this wonderful dog breed - the Miniature Schnauzer! The Miniature Schnauzer has a heritage that dates back to the 15th century, as a German farm dog. It's thought he was developed from his cousin, the Standard Schnauzer, the Affenpinscher, and Poodle. Photographed below is Ch. 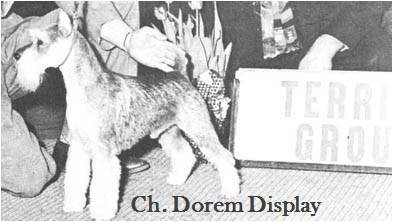 Dorem Display, the breed's first Best in Show winner. Born in 1945, the breed's history in America can be traced back to him. Most notable characteristics: eyebrows, thick whiskers, & leg furnishings. Double-coated - hard wiry outer coat and a soft close undercoat. The Miniature Schnauzer is a sturdy, muscular dog with pure elegance. Completely devoted to its family, obedient, and quick to learn the Schnauzer is spunky and fearless. These watchful, lively and energetic dogs are also friendly, intelligent, and willing to please. They do well living in the city or the country and can quickly adapt to any new environment. The only real need of this wonderful dog breed and companion is a sense of family. The Miniature Schnauzer must live as part of its family unit in order for it to truly be happy. And this Miniature Schnauzer book is an excellent source of accurate and in-depth information on the breed. It will help you and your family raise a healthy and well-behaved canine companion. Complete with a free training DVD that includes information on training methods, convenient diet options, grooming instructions, and health care information.